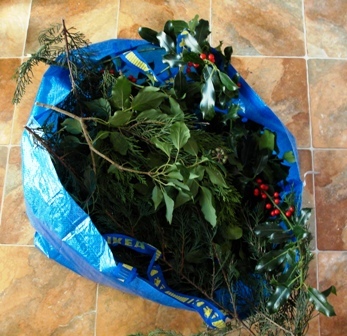 Create your own Advent Wreath with a few items gathered from a woodland walk. 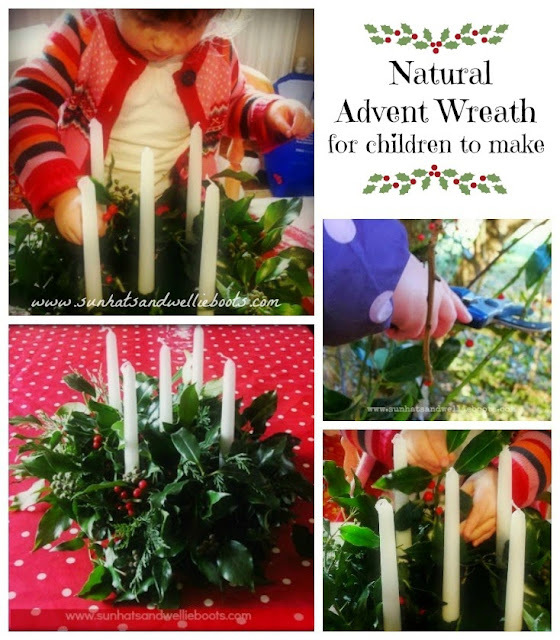 This is a great activity for all the family to be involved in as you prepare for Christmas, & the completed wreath offers a special way to countdown to Christmas as you mark each Sunday in Advent. This is the first year we've made one together, but I can see it becoming a yearly tradition! 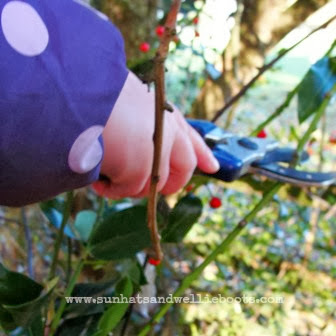 To collect the greenery we set off on a family woodland walk, armed with secateurs & a good ol' Ikea bag Minnie helped search for holly, ivy & conifer trees. 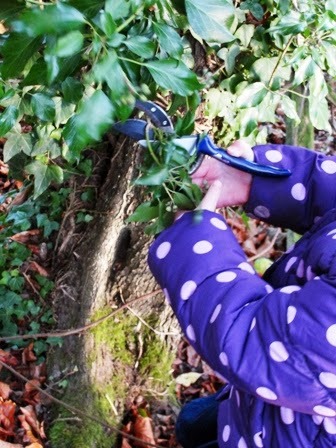 With supervision she learnt how to use & manipulate secateurs & managed to cut her chosen branches. When we had a good selection we headed back. 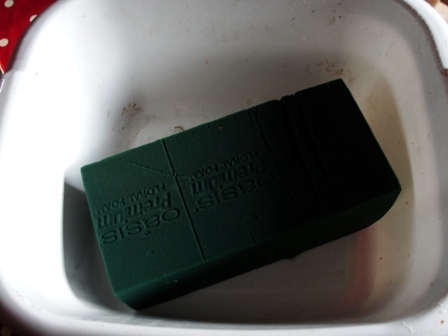 We had soaked a block of oasis (available from most florists) in water overnight, & then cut the oasis block in half, before cutting to size & adding to an old flan dish. 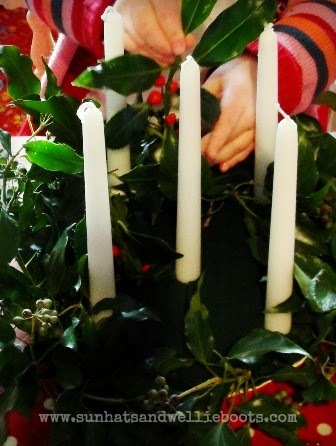 Once we were happy with the shape Minnie counted & added 5 candles. 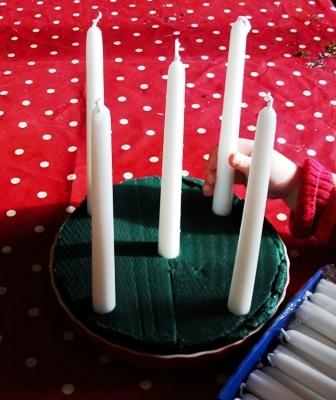 Four candles represent the four Sundays in Advent & the fifth is placed in the middle to represent Christmas Day. 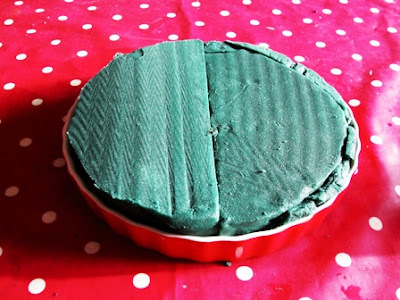 I stuck the initial pieces of ivy around the bottom of the dish & then Minnie decorated the rest. 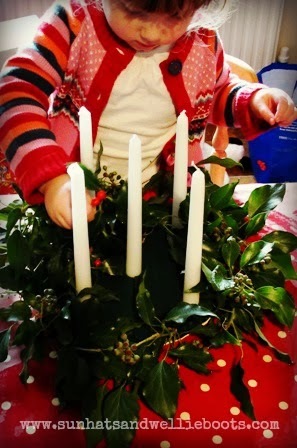 I loved the concentration on her face as she created her arrangement, & that she requested to listen (& sing along) to 'Away in a Manger' while she was creating! Creativity, design, appreciation of nature, & a range of motor skills were all explored in this activity, which Minnie was totally absorbed in. It was also a wonderful way to introduce Advent & how many Sundays were in the season leading up to Christmas Day. 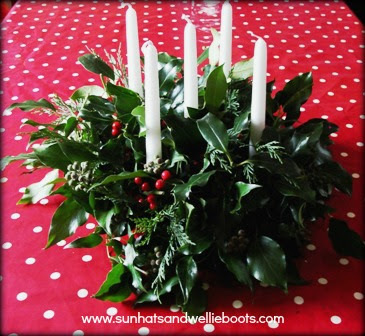 The Advent Wreath now sits as a centrepiece on our kitchen table & we're lighting one new candle on each Sunday during Advent. For my girl the most exciting part of this is of course... lighting & blowing the candles out at the end of the meal!